NetherRealm Studios held today’s Kombat Kast and as usual, went over two loadouts for three fighters from Mortal Kombat 11. Overall the character roster is shaping up to be quite diverse, providing fans of the Mortal Kombat series with plenty of different fighters to choose from, some old and some new. Last week’s Kombat Kast broke down The Kollector, Noob Saibot, and Erron Black. This week’s Kombat Kast focused on loadouts for the newly announced Kitana, Cetrion, and D’Vorah. For the stream, Tyler Lansdown, Community Manager at NetherRealm Studios, was joined by fellow NetherRealm employees, Shawn Hemmerick, Facilities Manager, Steve Brownback, Senior QA Analyst, and Derek Kirtzic, Senior Systems Designer. Hemmerick spoke quickly about a new form of currency coming to Mortal Kombat 11 called Time Krystals. Time Krystals are purchased with real money, and are used as a shortcut to unlock cosmetic items for your characters. It was clarified that there will not be lootboxes within Mortal Kombat 11, and that the items you buy with Time Krystals will not provide any in-game bonuses to characters. They then revealed a new trailer for Kitana before taking a deep dive into the stream’s characters. Ground War: Kitana dashes across the screen at ground level, smashing her opponent and sending them flying backward. This move is just a ground version of Kitana’s Square Boost move. Flutter: Allows Kitana to use a form of double jump. This move can be used to create space, dodge certain projectiles, or cancel a move to trick your opponent. Royal Protection: Kitana will absorb a projectile, which will then charge her fans with a damage buff. The damage buff is active as long as her fans are still glowing. Edenian Razors: Kitana’s fans circle her for a short time. This move can be used as an anti-air, or in the corner to add to your combos. Halfblood Stance: Kitana pulls out Mileena’s Sai. This stance gives Kitana two different attacks, one of which throws Mileena’s Sai into the air, the other gives her Mileena’s classic teleport move. Sai Stab: Kitana grabs her opponent, and stabs them in the face with Mileena’s Sai. Brownback mentioned that this move is great for ending a combo. Ground Pound: Cetrion smashes the ground twice, damaging opponents from a range. Rock Buff: Cetrion summons rocks wherever she is standing that float in a stationary circle, hitting opponents who step into its radius. It can also be used as a defensive tool, allowing you to sit back and hit your opponent with ranged attacks. Tornado: Cetrion launches a small tornado at her opponent. This small tornado will push opponents back if they block it. If you amplify this move the tornado will fly across the entire screen. Wind Tunnel: Cetrion summons a stationary tornado, that will push the opponent back allowing her to control the range once again. 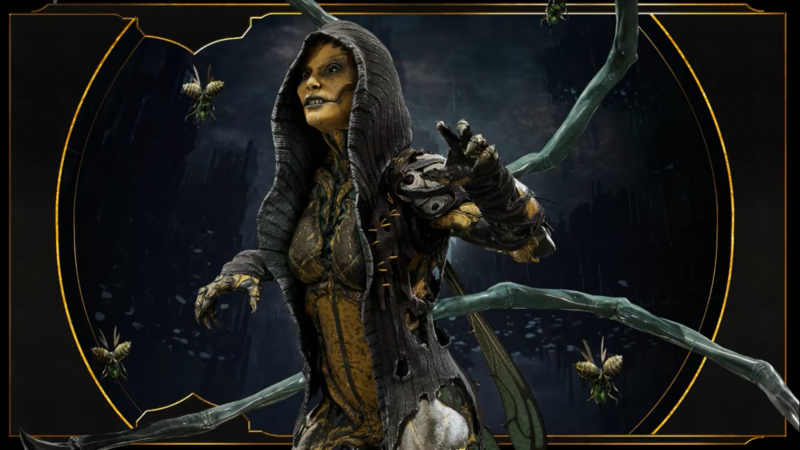 Widow’s Kiss: D’Vorah teleports onto her opponent, wrapping them up in webbing like a spider. It can be amplified to set the opponent up for an easy combo. Flippin’ Out: D’Vorah does a front flip, hitting her opponent with her back legs. Pooping Bug: D’Vorah spawns a bug that sends a small larva toward her opponent that deals damage. Can be amplified to send out three bugs. What did you think of today’s Kombat Kast? Will you be using any of these characters as your main when Mortal Kombat 11 launches on April 23, 2019? Are you satisfied with NetherRealm’s response about loot boxes and microtransactions. Let us know in the comments below! Purchase Mortal Kombat 11 on Amazon. This page contains affiliate links to products. We may receive a commission for purchases made through these links.